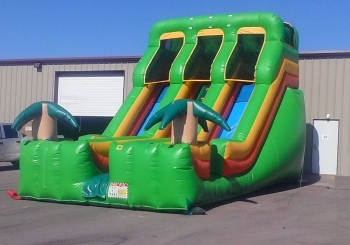 20 Foot Tropical Dual Lane Slide is a great addition to any summer party. You and your guest will have a blast cooling down and racing down this waterslide. This slide does not have a pool at the bottom, however it does have a landing that collects about 4 inches of water that you splash into. This waterslide is for all ages. JumpMaxx prides ourselves in providing America with newer, cleaner, high end entertainment with inflatables like the 20 Foot Tropical Dual Lane Slide and many others.